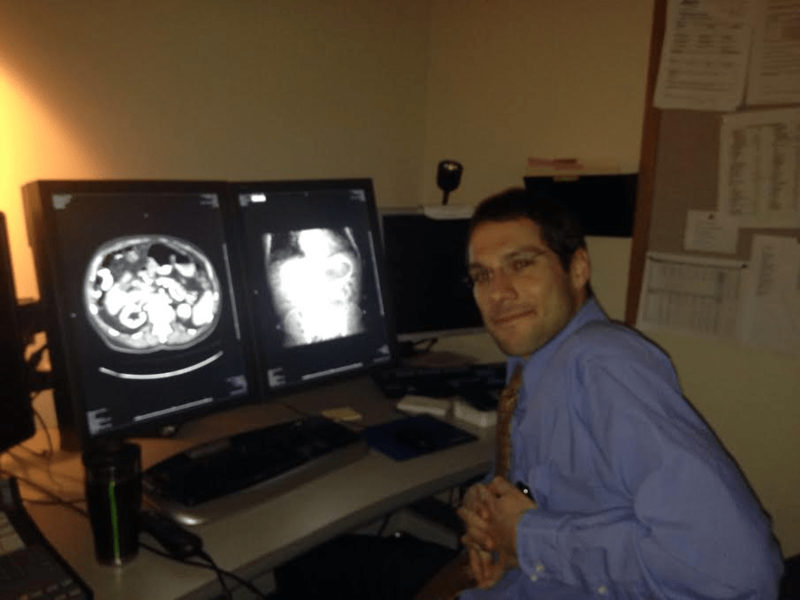 Career Profile: What Is A Radiologist? Large computer screens light up the dark room at Central Vermont Medical Center where Dr. Ben Lange works as a radiologist. Images of a brain in cross-section, the result of a CT scan, zoom in and out with every touch of his mouse. Radiologists use CT scanners, MRI scanners, x-rays and ultrasounds every day, and some uncommon equipments too, such as nuclear medical machines, which also takes images from gamma cameras and record radiation emitting within the body. The Computed Tomography (CT) scan is the most common machine in radiology. Dr. Lange uses CT scans to study all parts of patient’s body, such as the chest, belly, pelvis, or an arm or leg. The scan takes pictures of internal organs, such as the liver, pancreas, intestines, kidneys, bladder, adrenal glands, lungs, and the heart. It is also used to study blood vessels, bones and the spinal cord. But CT scans are only part of Lange’s work as a radiologist. “I also do several procedures each day, ranging from simple injections and biopsies to challenging cancer treatments and vascular procedures.” Dr. Lange says. “I do lot of catheter procedures in which I try to open up blood vessels so people have problem with their legs.” Smoking is the usual cause for problems like this, he says. Dr. Lange never heard about radiology until he was in medical school, when he was 24. He only vaguely knew that radiology existed. “I started to become a surgeon first, then looking something for radiologist,” he says. He got interested in radiology volunteering in a local clinic. After four years of medical school, then six years of training as a radiologist, he finished his education in 2015. Now he is 35, with one year of professional experience. “It’s a long way; it goes on and on,” Lange said of his studies. Studying medicine takes sacrifices, but there are great job opportunities and healthy salaries. “Luckily there is lots of doctors in general and radiologists in particular have a lot of demand for work. Getting a job is not so hard,” Lange says. The average salary for a radiologist in Montpelier is over $100,000 per year. But along with the good salary, radiologists face challenges everyday. “One of the challenges being a doctor is people come to you to get better but they do not understand what it takes to get better.”Dr. Lange says. Dr. Lange finds radiology rewarding as a career. “A good day with reading a mammogram of cancer, meeting with MRI that would be very important to their treatment and when you find that very satisfying, it helps them to improve their life,” he says.